"The stream of dwarven refugees arriving via boat is becoming intolerable. If this situation continues, a day will come when dwarves outnumber humans in this city. It must be admitted that the policy of demanding a high 'head tax' on all dwarven residents in Svardholm has failed - as it has been discovered on a recent raid (see Document CIsD-372, the long-time dwarven residents will shelter these refugees in secret and expand their subterranean complexes to provide additional living space. The possibility of the establishment of a 'dwarven undercity' below our streets obviously cannot be tolerated. Currently there are ongoing negotiations with the local dwarven leadership. 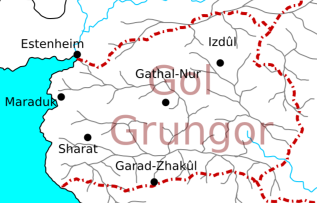 It is hoped that providing free train tickets to Zuidenstadt will at least take some of the new arrivals from Gol Grungor off our hands…"
This dwarven kingdom considers itself to be the heart of all dwarven culture in the world. Its monarchy stretches back for millenniums (or so its annals claim), and everything is done "because it was always done this way". Tradition equals law. Society in Gol Grungor is extremely stratified. There is a large number of clans bound by family ties, and each clan has an area of expertise on which it holds a monopoly. Highest in social esteem are the various craft families, such as masons, weaponsmiths, tool makers, and so on. After this come the ruling noble families, the mining and refining clans, and finally the military clans who are tasked with the defense of the realms. After this come the Clanless, many of whom provide all sorts of unglamorous but nonetheless vital services, such as farming (both subterranean mushroom farms and the surface farms in remote mountain villages - these are often worked by slaves), cleaning and other sorts of maintenance, and trade. Those convicted of severe crimes that aren't considered worthy of death or exile are also demoted to the status of Clanless, and their former families will shun them. The only way to join a higher-ranking clan is through marriage, and even that is rarely done - the would-be status climber had better come from a clan that is nearly the equal of the clan he wants to marry into, and both he and his family need to have excellent reputations for the family of the other side to agree to this. The state religion of Gol Grungor is the Cult of Harkat (another name for Hatramo), which preaches that it is the duty of every dwarf to accept the role he was born into according to his caste and family and follow the traditions even if it means laying down his life for them. Praying to other deities is strongly frowned upon by most dwarves, but significant cults to Aruk (Argannon) and Saruk (Sarush) exist, especially among the merchant class. Unless the party is all-dwarven, most of Gol Grungor will be off-limits to most of the PCs. Thus, any adventuring will initially be limited to Garad-Zhakûl, the gateway city. But since that community is a hotbed of trade and intrigue, there should be plenty of possibilities for adventures nonetheless until the PCs get a good feel for dwarven culture and society, as well as the fault lines that should gradually become apparent to the observant visitor. Getting smuggled deeper into the realm by friendly dwarves is a possibility, but since this involves the risk of execution for all involved upon discovery, this is not something that should be done lightly. Another way would be doing a huge favor for members of a high-ranking clan (such as saving them from certain death) - they then might be able to grant the PCs the title of Zhârum, or "honorary dwarf", which would allow them to move freely around the kingdom. They should better be on their best behaviour then, though - the dwarves will not forgive anyone the betrayal of such a great sign of trust, and follow the offender to the ends of the world to kill him.